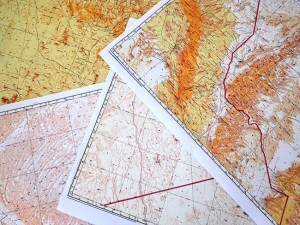 As we drove westward we passed a few nomads moving east. First there was a man with some camels. Then there were some families with goats. Not just a few goats, but an endless mass of goats that seemed as plentiful as the rocks. The herd seemed to fill the desert at one spot, and we stopped on the side of the road to photograph from afar. The women taking care of the herd were sitting on the other side of the road, and they seemed initially amused that their goats would be that interesting to a tourist. But apparently at some point they had the impression that we were counting the goats, and Mohammed explained they might get angry because of that. Apparently there is a superstition about it. If someone counts your goats it means one of them will die. We moved on, and I commented that there were so many goats it would be impossible to count them. Then someone said there were as many goats as stars in the sky. Later on, around the campfire the Tagazou and Saghd would make that into the line of a song, “…les chevres comme les etoiles…” They liked to improvise lyrics to the desert blues rhythms of the Tenere and could definitely kick it with any of the best western rappers in terms of poetry. We went to look for the young camel herder we had visited on the way into the Tadrart, but he had already moved on to another pasture. That is the way of the desert. People come and go. Everyone is always welcome but no one is ever expected. Everything happens Inshallah, and nothing is certain. It is a strange balance between the eternal and the ephemeral, right down to the way they live their lives almost void of any kind of expectations. Things happen, people adapt. There are no hard plans, only suggestions. And yet, at the same time, they are always prepared and thinking ahead. If we see firewood, we cut firewood. If we find water we fill up all the containers. If we come across an animal we can hunt, we will have meat. We take every opportunity where we find it. Our eyes are open and we are constantly on the alert. We stopped near what looked like a giant pile of rocks. A mountain of boulders, like some kind of cairn of the gods, rising up out of the emptiness in a flat spot of desert. We started to climb, using the boulders as “steps” and as I moved slowly I began to see the art work first on one rock, then on another. It was like a pile of stone canvases etched by different artists over centuries. Some were elegant and refined, others were rough hewn and simple. Why they were here, in a massive pile, no one knows. I speculated that maybe this was once a spiritual place where people came to worship or for some ceremonial reason. Mohammed, being more practical, thought that maybe it was just a place people came and watched over their animals and someone drew something first, and then another person came and saw it and added, and so on. There is no interpretive plaque to tell us the academic theories, so we can just let our imaginations go. After lunch we continued towards Djanet, but turned away from the town before we reached its edge, heading back into the desert towards the massive dune field called Erg Admer. We made a short detour en route to visit one of the most famous engravings in the region, “the crying cow.” As we reached what looked like three giant stone steles in the middle of an area of small hills and camel grass, we suddenly came upon several troop transports and lots of soldiers in tactical gear spread across the area. I started to make photos from a distance, but an officer noticed and came over and made me delete the images even though there was nothing special or even “good” about them. I cooperated, not feeling like it was worth the effort to save the snapshots that didn’t really depict anything yet. But I was very curious as to why all these troops were deployed here in this display of force. Mohammed pointed out the Algerian TV crew filming around the engravings. It looked like some important expert was being interviewed and all this security was for their benefit. Seeing the drama of the “security” for the journalists from Algiers, I was very glad that I was “under the radar” traveling with my Tuareg friends. We circled around the back of the scene, and parked the truck a bit away, walking to the location of the engravings, which turned out to be magnificent. The stylized cows’ faces were deeply etched in the stone, with a single teardrop coming from the eye. It was a beautiful work of art, but it could also be interpreted as an expression of the cows’ sadness at the loss of their lush habitat as the desert encroached. 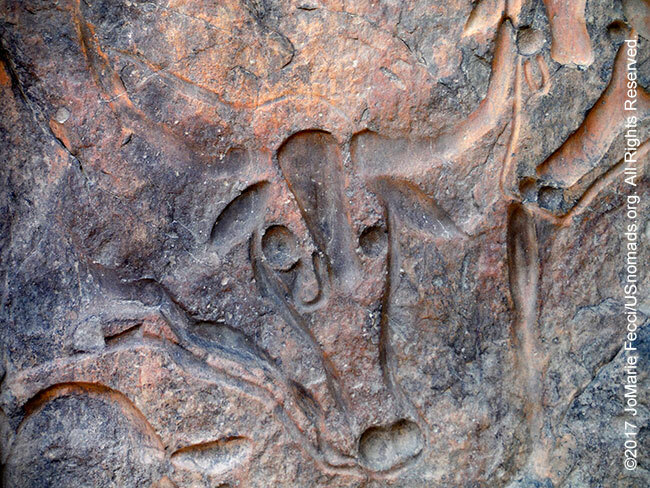 Mohammed explained that the “crying cow” title came from the first Europeans to uncover the engravings. He had another idea about it. He explained that the Fulani herders had a habit of putting a ring on their cows near the eye, and this could be a depiction of that, meaning that the artists were ancestors of the Fulani who are today found across the Sahel, on the southern edges of the Sahara. Regardless of the ethnicity of the artist or the actual reason for the “tears,” the crying cow image spoke volumes across the centuries, symbolizing for us today the losses associated with desertification and climate change as we look out over and arid sandy desert that was once a lush riparian habitat. The soldiers and TV crew were gone by the time we left the place of the engravings, and we took off freely into the desert to find a place to camp in the middle of the dunes for one more night of music under the stars.